Yerevan's Republic Square. (c) Gevorg Ghazaryan/Xinhua News Agency/PA Images. All rights reserved.On the evening of 23 April, Armenia celebrated the resignation of Serzh Sargsyan, the man who had ruled Armenia for ten years as president — and for a week as prime-minister. Strangers hugged and congratulated one another, cars honked their horns, and shops ran out of champagne. Everybody celebrated in their own way: some put tables in the streets and marked the occasion traditionally, with vodka and a barbecue, while others danced to Berlin-style techno music in bars. Still, the happiness seemed universal. Today, on 25 April, the protesters are back on the streets. As one of the protesters said to Radio Liberty correspondent on the station’s live feed: “We have overthrown the tsar, now we need to overthrow tsarism.” Formally, the protests have a new target — acting prime-minister Karen Karapetyan, who represents the (still) ruling Republican Party, which at least at the time of writing, possessed the majority in Armenia’s parliament. 25 April: Republic Square, Yerevan. Source: Mikayel Zolyan. None of this seemed even remotely possible even a month ago. The success of the protest movement has been a surprise not only to analysts, but even its leaders. 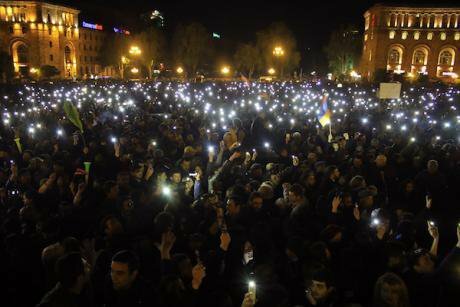 Arguably, when the protests were starting, the most the protest leaders could have hoped for was to unify the opposition and complicated the transition to parliamentary republic, thus harming the legitimacy of Serzh Sargsyan. But as often happens in authoritarian regimes, when the protests passed a certain threshold, the government was no longer able to stop them. One of the reasons why these protests have been so successful lies in the broad coalition that Pashinyan and his team have been able to build. 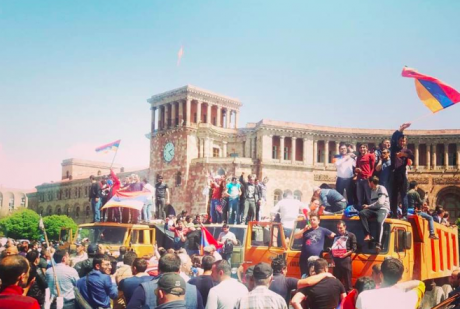 Apparently, Sargsyan and his plans to remain in power indefinitely were so unpopular with the majority of Armenians that the protests united people across the political spectrum — people from different social classes and with different lifestyles. On the days of the protests, one could see bearded hipsters and “rabiz” guys in tracksuits (the Armenian version of “gopnik” subculture), “glamorous chicks” and short-haired feminists, people on old Volkswagens and people in Mercedes jeeps, all taking part in the same protest actions. At the same time, the most active force of the protests were the youth, university and even high school students. Whether Karen Karapetyan will make a similar statement to Sargsyan is up to the people on Armenia's streets — and more specifically, their numbers.